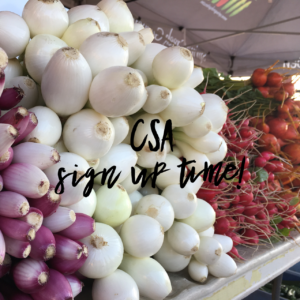 Click here to SIGN UP for CSA!! Spring Creek Garden is offering a CSA (Community Supported Agriculture) Program. This program is perfect for those people who do not have time to attend a Farmers Market but are still seeking fresh local produce, business people and seniors who wish to have produce delivered right to their place of work or home, or someone who simply appreciates the convenience and variety this program offers. This program is offered with a typical Saskatchewan growing season in mind. We hope to provide consumers with 14-16 weeks of fresh produce. Every week will offer something different as new vegetables come into season. 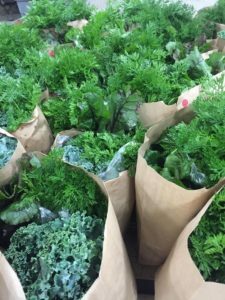 CSA Boxes typically start off with less quantity and selection and then as the season progresses, CSA becomes filled with more variety with veggies coming into season! Spring Creek Garden grows over 50 different varieties of produce so you will receive the staples of the garden, potatoes, carrots, peas, beans, but will experience less common types as well, such as, kohlrabi, kale, cauliflower or zucchini. ***Single Box offers small selection of varieties in comparison to the Half and Full Box. *Special drop-off locations available for large groups over 20 members in the Saskatoon area. Email for more information. *As more people sign up, we will be adding pick-up locations. If you are interested in signing up for the CSA and live anywhere in Saskatchewan, please email us your contact information. When a reasonable amount of people have signed up in your area, Spring Creek Garden would consider making a special pick-up location to suit you! Click here to request a new pick-up location!